I continue to be of the view that we are in the early stages of a revolutionary period and that the companys which survive will not be the ones that composed the DOW/ FTSE/ Nikkei indexes of the last 30 years. There is a shift occurring and the economic crisis is only a symptom, as global balances shift and move in ways we cannot even comprehend today. Anyhow, in related news, yet another bastion of the old economy is in dire straits. JAL (Japan Air Lines) began in 1951, first flew to San Francisco in 1954, and in 1987 became 100% public owned. 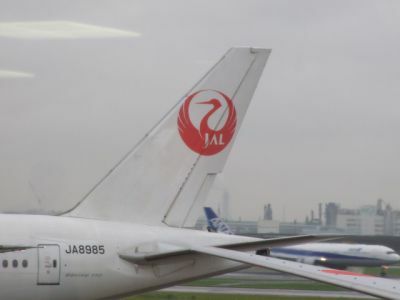 In 2002, JAL took over JAS (Japan Air Systems). 2009 November was their worst financials. JAL stock has dropped from ¥210 to ¥4 today. Anecdotal evidence suggests that even government employees have been abandoning JAL for competitor ANA recently. 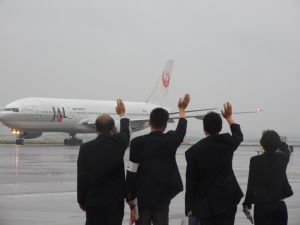 Listening to my wife, there is a tremendous sense of patriotism and loyalty to JAL and they have continued to disappoint, yet this is a big day in Japan as they watch this situation unfold. Out with the old companys and in with the new … banks, are you watching? JAL’s expected filing for court protection from its creditors is one of Japan’s biggest corporate failures. The government is preparing at least Y900bn ($9.9bn) in new equity and credit lines to keep the airline operating while in bankruptcy. The slowing down of the slowdown continues everywhere, but still a long way to go. We all rely on imports from countries such as Japan, and it seems we are beginning to buy again. Japan’s current account, the broadest measure of the country’s trade with the rest of the world, logged in April a Y630.5 billion surplus, a decline of 54.5% on year, data released Monday by the Ministry of Finance showed. But in a positive sign that overseas demand is picking up slightly, exports fell less precipitously in April, dropping by 40.6% to Y3.915 trillion, compared to their 46.5% fall in March. In a surprising statement Bank of Japan Governor Masaaki Shirakawa announces improvements in the Japanese economy. It is surprising following several years of slow economy even before the economic crisis we are now in. Click through for that, and a review of several economies including Canada. WASHINGTON (Reuters) – Japan raised its economic outlook for the first time in three years on Monday, and an important measure of German business sentiment rose in May, in further signs the worst of the global recession may be over. I look at the number of people losing jobs, stores closing, and while in Azaba Juban last week, it was very quiet and I could feel the difference. Next to Tullys a new coffee shop closed after two months, and is replaced with a cheap meat restaurant. I think it is too early to say it is over especially when he said this just a few weeks ago. Previously, the government had said the economy was worsening rapidly and in a severe state. This from Japan might be a forerunner of things we might see in North America. A Foreign bank (French) involved in manufacturing information, based on insider information to improve a stock price. With the predicted problems in commercial real estate to come, there will be increased pressure on banks with such investments. TOKYO, May 8 (AP) – (Kyodo)—The Japanese unit of France’s BNP Paribas is suspected to have made a false report to the Financial Services Agency regarding trading of shares in Urban Corp., a now failed Japanese property developer, sources close to the matter said Friday. The fall in GDP for Japan appears nothing short of catastrophic, yet on a visit there last week by Nobuyo, the effects of this change are not obvious to the everyday Japanese person. One change that was noticeable in Tokyo is less foreigners (Gaizin). The area around Roppongi and Azabajuban is normally where one can expect to see many western faces in the restaurants and bars. No more. Companies such as Lehman Brothers, Merrill Lynch, and AIG as well as numerous other western financial services companies had representation in Japan, however that is quickly shifting. This still does not appear to impact the average Japanese, at least not yet. In fact as the country ages it almost seems to fit with a reduced economy. The data, released on Wednesday May 20th, showing a 4% contraction of GDP on a quarterly basis, and a 15.2% annualised slump, reflect a continuation of Japan’s worst economic performance since the mid-1950s. Not only were the first-quarter figures bad. The previous quarter’s horrendous fall was itself revised downward by more than two percentage points, to an annualised 14.4%. In keeping with watching for new and innovative shifts in banking, Societe Generale subsidiary Lyxor plans a big push with new ETF’s in the Japan market. These are being offerred online only. Lyxor Asset Management is planning to expand its exchange traded product range in Japan and the rest of Asia as investors in the region gradually gain more knowledge about the funds. The subsidiary of Société Générale will introduce 15 new ETFs into Japan this year, and market them through online brokerages, Lyxor says. That will add to the asset management firm’s existing 13 ETFs currently available to Japanese investors. The new ETFs will feature funds already listed in Europe.